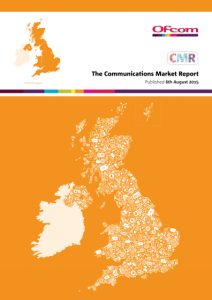 The UK TV industry generated revenues of £13.2 billion (€18.9 billion) last year, up 3.1% year-on-year despite changing viewing habits and an increasing reliance on smartphones and tablets, according to Ofcom. 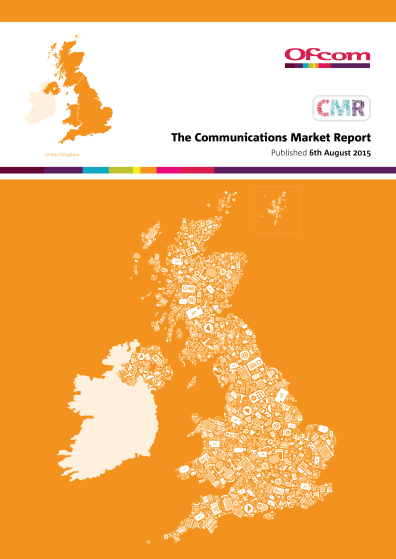 The UK broadcast regulator’s twelfth annual Communications Market Report claims that the overall increase was due to gains across all revenue sources – namely a 5.1% increase in BBC income allocated to TV, a 3.9% increase in net advertising revenue, a 1.9% increase in subscription revenue and a 0.9% increase in all other revenue. Pay TV revenue climbed 1.9% from £5.9 billion in 2013 to £6 billion in 2014, but this growth slowed from the 6.5% annual increase in revenue seen between 2012 and 2013. Online TV revenue by contrast has “increased rapidly in the past five years” but still represents only a small proportion of total TV revenues, said Ofcom. Online TV revenues grew by 38% in 2014 to £793m, with income from online TV subscriptions increasing by 53% to £317m. According to the report, the TV is the device that adults said they would miss the most, cited by 37%. However, Ofcom also highlighted changing TV viewing patterns, with most 16-24 year olds found to watch on-demand and catch up programmes on computers and smartphones rather than on a TV connected to a set-top box. Some 57% of young people said they regularly watch on demand and catch-up TV on their laptop or PC, 45% watch on a smartphone, while 40% switch on a set-top box. Ofcom described the UK as a “smartphone society” and said that smartphones have overtaken laptops as the most popular device for getting online.